Ultimate handbook for backpackers and first timers in Cagayan Province, the home of Callao Cave and Palaui Island where a season of Survivor USA was filmed, this guide will make your Cagayan travel a breeze. Detailed commute directions to attractions of Cagayan, very cheap lodgings, eateries, fares and tips. Everything to cut costs for budget travelers is written here. Immediately below, next to Callao Cave photo, are links to the contents of this article. Check out the links so that you know what to expect in reading this guide. Click a question to read its content. To return here, click 'back button' in each subtopic. What are the travel destinations in Cagayan Province? Where is the jumping-off point to Cagayan attractions? 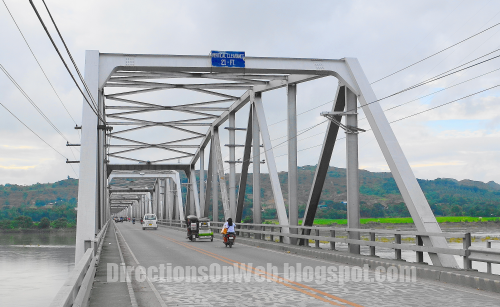 How to get to Tuguegarao City from Manila? Where are cheap lodgings situated? How do I get around Tuguegarao City? How to get to Callao Cave? 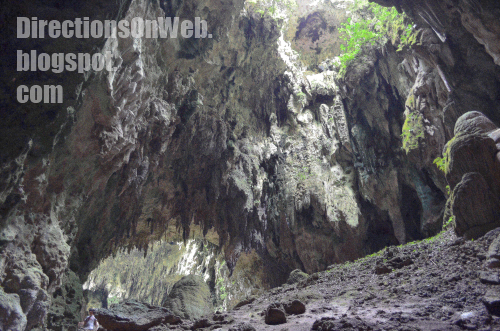 How to return to Tuguegarao City from Callao Cave? How to get to Tuguegarao Cathedral? How to get to Buntun Bridge and back? How to get to Iguig Calvary Hills? How to get back to Tuguegarao from Calvary Hills? How to get to Palaui Island? How much is the cost of Palaui Island Tour? Whom to contact for Palaui Island tour in advance? How to return to Tuguegarao from Palaui or Sta Ana? Where is Palaui Island in Cagayan map? How to get to Tumauini Church? 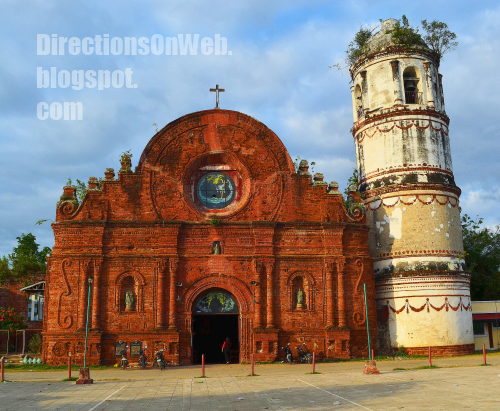 How to get to Tuguegarao City from Tumauini Church? What is your suggested route in seeing Cagayan destinations? How to get to the scenic Patapat Viaduct? What to eat in Tuguegarao City? Tips for budget travelers & backpackers? What are the best months to enjoy traveling in Cagayan? Where is Cagayan in Philippine map? Note: You can skip the subtopic links by scrolling down as you read. 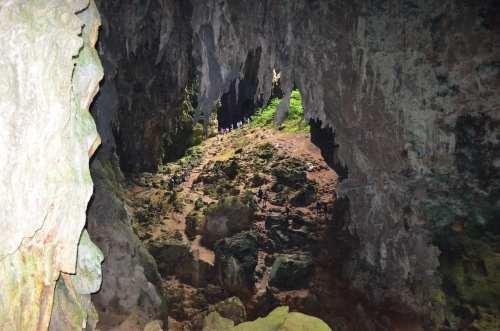 The major attraction of Cagayan nearer to Tuguegarao City is the Callao Cave (pronounced as kalyaw), located in the rural town of Peñablanca. While in the city, don't forget to go to Buntun Bridge, the second longest bridge in the Philippines, you'll enjoy the unobstructed view of Cagayan River while walking the entire length of the bridge. Right at the city proper, the imposing Tuguegarao Cathedral aka St Peter Metropolitan Cathedral capped the skyline with its 5-storey quadrilateral bell tower. Outside the city, Iguig Calvary Hills at the back of St James the Greater Parish is a must-see spot of Cagayan too. It has a commanding view of rolling hills covered with bent-grass where life-size statues of stations of the cross are erected in artistic formation. But the destination you must not forget to include in your Cagayan travel is the Palaui Island (pronounced as palawi), which was the location of a season of reality show Survivor and aired on 2014 as 'Survivor: Cagayan.' Palaui Island jumping-off point, the San Vicente Port of coastal town Santa Ana is approximately 100 kilometers away from Tuguegarao City. Another important destination, located in Isabela, is a national cultural treasure as declared by the National Museum. The Tumauini Church, built over 200 years ago. 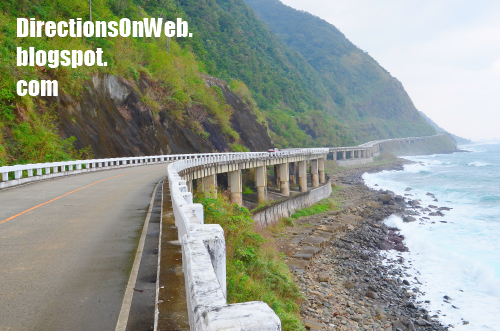 Although not located in Cagayan, Patapat Viaduct is worth the side trip considering it is in the center of the northern tip of mainland Luzon. Main reason is the great views. Here, the association of word attraction to the term viaduct is ultimately an excellent one. Make sure your camera is not yet full before heading to its location. Originating from (Metro) Manila, your jump-off point to all attractions in the Cagayan including Patapat Viaduct in Ilocos Norte, is the booming capital of Tuguegarao City. Two major means of travel - by air and by land - have their terminals in the city. Hotels, both high-end and budget lodgings, are easy to be found. Authentic Cagayan dishes such as pancit batil patong and pancit cabagan as well as original dinendeng are served almost in every restaurants and eateries. So, head to the nearest bus terminal and reserve a ticket. I recommend Victory Liner as it's the one I used. And the budgets lodgings and cheap hotels are only a stone's throw away from its Tuguegarao terminal. Both plane and bus served travelers bound for Tuguegarao. There's a Victory Liner terminal in EDSA-Kamias. You can also use Five Star but its terminal is a bit far from hotels and cheap lodgings. Bus fare from Kamias to Tuguegarao as of this writing is Php 647. Opposite the terminal of Victory Liner, across the road is row of very affordable lodges and low-cost hotels. They are not actually next to each other as there are other establishments between them. Just avoid the "NetOne" hotel which is the only one lighted at night that you would think it's the only one hotel there. Rate is higher on that particular place. If you arrive at night, just walk along the highway past NetOne hotel and you would make out the unlighted signs of other hotels there. As of this writing, the lowest room rate type is the 12-hour fan only and no TV. The rate is Php 300. It's good for backpackers as you just need to have a bed to sleep and a bath in the morning. The fact that there's no television is to your advantage because there's no temptation to push a remote and consume your time in TV watching. You get to rest longer and have ample sleep. The check-out time is always 12 hours past your check-in time. So, if you have checked in at 2 am, they don't force you to check out at 12 noon. Although in cases like this, you will be too excited to get out early. 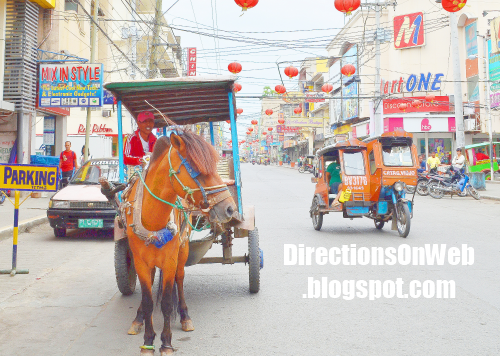 There are two types of public transportation within the city of Tuguegarao - horse drawn carriage and motorized tricycle. First thing first, "Plaza" is a word to remember when riding a tricycle or calesa, if your destination is the main avenue of the city proper where big commercial buildings, malls, banks, drug stores, bargain centers, restaurants, expensive hotels, fast food chains, market place, etc are located. Upon boarding, just say to driver "Plaza" and he'll take you to that area. You can alight in front of the huge Mall of the Valley and explore the city center or check out the bargains and souvenir shops there. Minimum fare is 10 pesos for both of the transport vehicles (horse drawn and trike) and that covered the distance from areas of hotels in Victory Liner vicinity. You will think that the street should have been named Rizal Ave but it's not. And most locals don't know the name of the street as they refer to it only as "Plaza" even if there's no actual plaza anywhere there. Interestingly, the road name is Bonifacio and Rizal St is the one paralleled to it two blocks away and the one bounded Tuguegarao Cathedral. Rizal St doesn't even look like a main street, pretty much like a back alley. Maybe because it's Bonifacio St that teeming with business and commercial activities. Spelunking travelers (center of photo) looked like ants inside the cavernous Callao Cave. Outside your hotel, flag down a tricycle and ask driver to take you to the terminal of tricycles bound for Callao Cave. Please pay attention to what I say here if you don't want to spend a lot of money in getting to the cave. The trike from your hotel might request for extra but you can negotiate up to 30 pesos because the Callao bound tricycle terminal is a bit far. It's alright. But once in the next trike terminal, be smart. Except if you have a lot of money. The drivers will approach you and offer a Php 500 peso fare right off the bat. Now if you're in a group of six that would be okay. But if you're alone, that's crazy. I paid only 45 pesos. How did I do that? I said "I don't have money and I will just take the one in the queue and share with other passengers." So I boarded the one waiting for local passengers. But you have to "mention to the driver that you are headed to Callao Cave itself." The trike will drop all local passengers at their respective houses so expect that it will get in a barrio before taking you to your destination. You will be the last one to be dropped at the end of the road by the river. You will take a small boat, the fare is 20 pesos which also covers your return from the cave. Across the river, you must register first and pay the 10 pesos entrance fee if the officers in the outpost at the boat terminal told you to skip them and just pay after crossing the river. You have to trek up about 200 steps of stairs before you see the cave. Getting to Callao Cave is a breeze and inexpensive if you follow this. It's important that you're already done in Callao Cave by 2 pm to ensure you get a trike back. Trek down to the river bank and wait for a boat to arrive. You must stand in line if there are some locals or other travelers ahead of you. Get in the boat and don't pay again as it's already known that you're already paid. Walk to where you were dropped by the trike previously. Option 1. Wait there for a trike. If you get bored, do Option 2. Take the path of the trike that brought you to the river and walk your way to the terminal where tricycle that don't have passengers headed to the river is parked waiting for passengers. The terminal is at the waiting shed of the barangay. You might pass by a first shed but it's no longer used and covered in fences. The one you're headed is after the road turned left. It's better to walk because in my experience, once there's new tricycle bringing a traveler or passengers to the river, the driver will signal to you that you can hop in. As soon as he drops the passengers by the river, he will drive to their designated terminal where he waits to be filled. Now once you get to the main terminal in Tuguegarao, take another tricycle back to the city proper. The best time to get to the cathedral is when you're in the city proper, particularly in Bonifacio St. From the frontage of Mall of the Valley, walk toward McDo and Jollibee until you get to the next corner which is Luna St. As you look to your left toward the end of Luna St, you will immediately see the church. Walk past Hotel Roma to get there. After your tour of Tuguegarao Cathedral, you can breeze into Buntun Bridge which is located at the west end of Luna St. Tuguegarao Cathedral is located at the east end of Luna St. They are opposite each other. Take a tricycle along Luna to get to the bridge. The driver might charge extra because it is farther and Luna St becomes Buntun St as you get nearer. Depending on how you haggle, you can get there for 30 to 40 pesos. If you decide to walk the entire length of the bridge, you can return to the city proper from across the river by taking another tricycle east bound. From a hotel near Victory Liner or from downtown Tuguegarao, take a trike and ask driver to take you to Don Domingo Public Market. Tanza Junction is very near to hotel row in the vicinity of Victory Liner. You can walk to get there, have some budget meal inside either Jollibee or Mcdo then walk your way to Don Domingo Market. Inside the jeepney, ask driver to drop you off at the corner of the road that led to St James Parish Church. You can add that you're going to Iguig Calvary Hills. Once gotten off the jeepney, cross the main road and hike the uphill road where the church is located at the other end. Once in the church, you will easily see the way to the Calvary Hills. The entrance is located at the left hand side of the church if your facing the frontage of the church. In the map below is the location of the jeepney bound for Iguig. Click each pin to reveal its information. If you drag the map toward bottom, you will see the location of Victory Liner Bus Terminal and how near it is to Tanza Junction where Jollibee and McDonal's are located. Return to the highway and flag down a van with sign that reads "Tuguegarao City." You must alight at the spot near to the downtown as their terminal might be located way too far like the one I have ridden. If you don't know how to go back to either Tanza Junction or Plaza area, take a trike and you can ask him to bring you directly to your hotel or to your next spot of destination. The jumping-off point to Palaui Island is San Vicente Pier which is popularly known here as San Vicente Fish Port. It is located in the municipality of Sta Ana which is the northeastern tip of mainland Luzon. To get there from Tuguegarao City, you will travel approximately 100 kilometers via public van to Sta Ana, Cagayan. The terminal of vans is located on the left of the other end of the road where Don Domingo Public Market is situated. See map below, click the red pin at the bottom of the map. Coming from Jollibee/Mcdonald's Tanza Junction branches by foot, walk past Don Domingo Market where you boarded a jeepney to Calvary Hills, until you see the terminal to your left and located meters away before the road ends at Balzain Highway. Take the van bound for Sta Ana. If you're coming from your hotel and you take a tricycle or calesa, make sure that the driver will take you to this terminal. Because there's another terminal of vans bound for Sta Ana but passengers there are so scarce you will wait hours before the van gets full. The vans in the terminal located near Don Domingo Market is known to locals so passengers keep coming and the van gets filled up fast. The fare as of this writing is 180 pesos. After the long journey, the van will stop at Santa Ana Market. You can buy stuff there before heading to the port. There are hotels and lodgings around the market too if you prefer to explore Palaui Island early morning of the next day. Rates of hotel range from 300 to 400. Terminal of trikes headed to San Vicente Port is in front of Sta Ana Commercial Center which is the market building itself. You can skip getting off at Sta Ana Public Market and go directly to San Vicente Port which is the last stop of the van. If you choose that, ask driver to drop you off at Arnold Peralta's office. He rents boat to travelers and he is licensed Palaui Island tour provider under local government unit in Sta Ana, Cagayan. Next to the map below is subheading "How much is the cost of Palaui Island Tour", please check it out if you want to know rates of boat rental, guides and other fees. Highlight - Trek to the lighthouse of Engaño Cape, enjoy the island's white shore, throw a memorable daytime picnic, etc. Note: You can camp out overnight at Anguib Beach for 100 pesos but you MUST bring mosquito repellent or mosquito net. 'Niknik' as locals call it and a kind of mosquitoes and biting insects that attack even at daytime are unforgiving. Palaui Island is a protected area and you can't just rent a boat and sail onto the island. If you do, officer manning the island right at where boats dock to unload passengers will stop you. You must have processed and obtained receipts of payments at authorized tour provider of Palaui Island. Most importantly, you must have a guide which also provide by the tour provider. Without a guide, there's no way you can go beyond the sentry's outpost. That said, you can avoid the inconvenience by having an authorized person assisting you even if you're still on your way to San Vicente Port or better yet make advance arrangement for schedule of your arrival days before the date of your travel. This allows for a better time management and stress free travel. I highly recommend Mr Arnold Peralta, in photo above taken at his office which is just few meters away from his boats' docking area. He's the head of boat association and owns boats of varied sizes. He employs guides and boat skippers. He is licensed under local government unit and his boats are seaworthy with enough life jackets that they also required to be worn while on-board. Please be reminded that it's open sea that you would traversing in going to Palaui Island. The waves are bigger and at times rogue. A boat that passed government agency's requirement is your only defense for safe sea travel and with number of precautionary measures in place, you have peace of mind that you need in embarking to an adventure in area like Palaui Island. The office of Arnold Peralta is also charged in safekeeping of boat's manifest. So you must register your name there as required by law for your own protection. How's about that for reassuring? Furthermore, he is hands-on in entertaining guests and clients. A very unassuming person, approachable and reliable. You will definitely like him. You can call him at 09154670964 or 09293920737. Get back to Tuguegarao City the way you came to Sta Ana. You can take a trike in the port or along the road outside. Just don't use one in the terminal there as they'll ask you to contract them at high price. Wait for one to arrive far from the trike terminal and take that one as they charge regular fare. The terminal of vans bound for Tuguegarao City is in front of the market area. The terminal of vans going to Tumauini, Isabela, Cagayan is located at the area popularly known as Riverside. 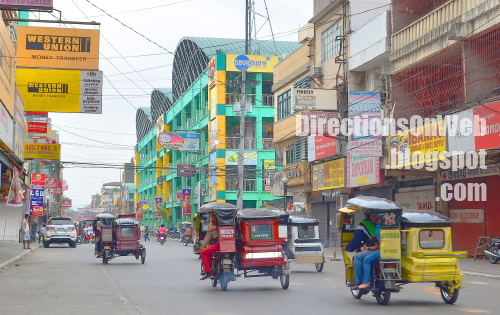 Take a trike from anywhere in downtown Tuguegarao or from your hotel and ask driver to bring you to Riverside. Fare from Riverside to Tumauini is 60 pesos. In the van, talk to driver and tell him that you're going to Tumauini Church and ask him to drop you off at the corner of the road in Tumauini from which you will enter to reach the church. The road is on the right of the highway so no need for you to cross. It's a bit tricky if the driver drop you off early. Walk from the highway past two intersections and turn left on the third intersection. Walk further until you get to the compound of the church. That's the direction to take if the driver drops you off at the street where a communication tower is situated and seen from the highway. That's where I was dropped off and given a walk direction to the church by the driver. Now if the driver drops you off at the corner of the street that leads directly to the church, just walk straight past two intersections and the church will come into view at your right. If you have decided to go to Tumauini Church first before the other major attractions of Cagayan such as Callao Cave and Palaui Island, it would be better as Isabela is located south of Tuguegarao City. Walk your way from the church to the highway and go towards Tumauini Public Market. That means you will turn left once you reach the national highway from the church or towards north where Tuguegarao is located. Vans bound for Tuguegarao City stop there and there are also loading terminals in that area. The best itinerary if you're travelling to Tuguegarao City by land is to see Tumauini Church first. Because the town of Tumauini comes first before the bus gets to the city of Tuguegarao. And the distance between Tumauini and Tuguegarao is a bit way far. So, if you get there hours before daybreak just kill time in some eatery until daylight. Then head to Tumauini Church. That way, you get to arrive in Tuguegarao City still early. In Tuguegarao City, go head to Callao Cave as early as possible because you must be on your way back to Tuguegarao riding in a tricycle from near river by 2pm. Unless you are a gumptious and hitching is not an issue just like what I did, make sure you leave the cave by 1pm. 11 am to 1 pm is the best time to be inside the cave as the sun rays coming in from the opening above create a very astounding scenery worth photographing. You can get to Buntun bridge even near dusk and Tuguegarao Cathedral is a stone's throw away from city center. Iguig Calvary Hills aka Calvary Hills Cagayan is great in the morning as the sprawling and rolling hills in which the life-size stations of the cross are erected wouldn't be friendly if the sun is already high-up. So, you might want to get there early morning of your second day. After your meandering in the Calvary Hills and back to Tuguegarao, take the van bound for Sta Ana for your island hopping of Palaui Island and its neighboring headlands such as Crocodile Island. It'll take up over half of your day to cover all attractions in the promontory region much of which are consumed by boat ride from one spot to another. 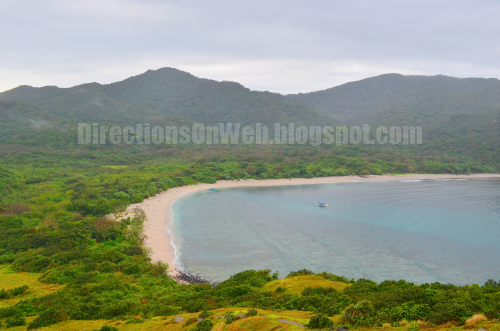 Palaui Island being the main attraction commands astounding view of its white sand seashore from the trail above going to Cape Engaño Lighthouse which is at the top of the island. Trekking uphill to the lighthouse is wonderful experience as you get the preview of Batanes. From Sta Ana Commercial Center or market area, ask trike driver to take you directly to the office of Arnold Peralta. Other destinations served by boat from San Vicente Port are: Anguib Beach, Crocodile Island, Pugo Moro, Punta Verde, Puzurubo and Siwanag Cove. Please check out How much is the cost of Palaui Island tour. Although Patapat Viaduct is not part of Cagayan Province as it's located past the border of Ilocos Norte's coastal town of Pagudpud, it still is worth the trip especially if you're already in Sta Ana fresh from your Palaui Island adventure. The best time to travel to Patapat Viaduct from Sta Ana is at daybreak. You get there in balmy morning. But most importantly, there are still public buses and vans bound for Tuguegarao that would pass through the bridge if you decide to go back to Cagayan's capital. That said, make sure you're done viaduct sightseeing at around 2pm. Wait for any van or bus back to Tuguegarao. As there's no terminal there, you will wait for a bus or a van from Laoag to arrive. After your Palaui Island tour, go back to Sta Ana town proper. Spend the night at a cheap lodging by the Sta Ana public market and take a van bound for Tuguegarao first thing in the morning. Ask driver to drop you off at Lal-lo Junction through which buses bound for Laoag, Ilocos Norte pass. Wait for Laoag bound bus at the section of the road where a lot of passengers are waiting and Magapit Suspension Bridge can be easily seen from the distance. The bus to Laoag will pass through that suspension bridge and so you know which lane to wait for the bus, right? The one getting to the suspension bridge. That's a landmark there. 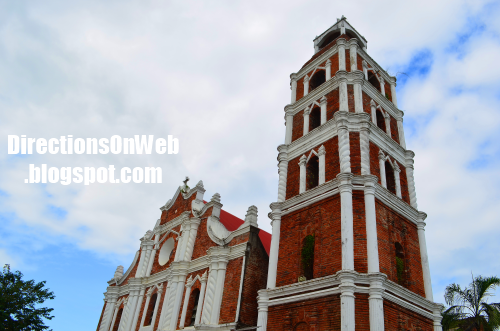 So which city should you be headed to after Viaduct sightseeing tour - Laoag or Tuguegarao? To help you decide, read my Tips Section, here. There are regular trips of buses from Tuguegarao to Laoag and these buses pass through the viaduct. But since the purpose of this guide is to manage your time and money in travelling from one spot to another, I will not advice you to go directly to the viaduct from Tuguegarao. Instead, make Patapat Viaduct as your side trip from Palaui Island as you are already near the famed mega architectural structure of Pagudpud, Ilocos Norte. Read the direction on how to get to the viaduct from Sta Ana, Cagayan in the last paragraph of my suggested route in seeing Cagayan attractions. There are three kinds of authentic food that you should not miss out once you hit the streets of Tuguegarao City. Now there are so much information written about these delicacies including how they are made and cooked so we will not dwell on those details. Instead, let me just present to you each of the dainty chows I have savored in Tuguegarao that made me wish I could find a place in Metro Manila that served them. 1. 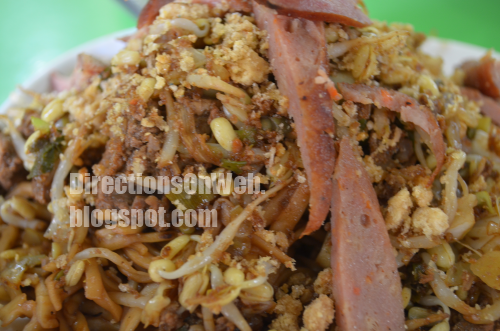 Pancit Batil Patong is the first on the list that you should taste as soon as your taste buds crave for pancit. A full meal loaded with carbohydrate, protein and all nutrients a traveler needs. From the bean sprout mixed together with a special kind of noodle to the pork rinds mixed to sliced meat, topped with sunny side up egg, the blending of different tastes has never been so delicious. So tasty and filling. Eaten with a sauce made of mixed soy sauce, vinegar, chopped onion and chili pepper. Plus a hot meat broth on the side, pancit batil patong meal set is so appetizing. A perfect complete meal. The only lacking in the meal? Soda. I mean it's a treat, right? So, why not indulge. Just this once, LOL. 2. 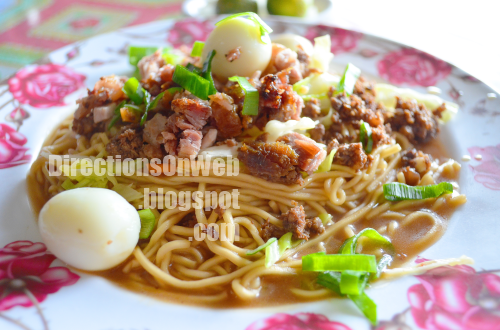 Pancit Cabagan has contrasting element compared to Pancit Batil Patong. It is soupy and palatable at the same time that you'd consider its savor as a Filipino dish eaten with rice. As a result you would be tempted to order a serving of rice or two. The quail eggs added the temptation for rice I presumed. It's really a must-taste food. It's also served with a cup of broth notwithstanding the soupy state of the dish. And the grated white onion and sliced lime on the side made this Cagayan noodle dish more appealing to one's sense of eating. 3. Dinendeng has a lot of versions. 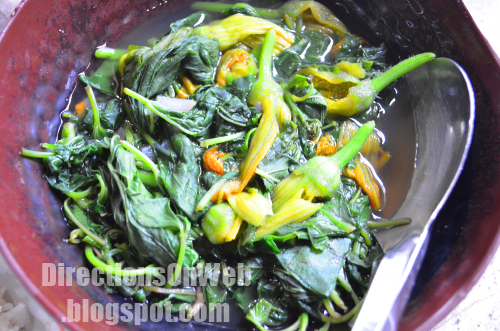 But the one I have tasted in Tuguegarao City transcends the general savor of dinengdeng. From aroma that comes from squash flower to the vegetable broth, you would literally feel you're digesting a highly nutritious Filipino dish. Vegetables are fresh and cooked while you wait. And that's the part I like most. Because when it's finally served, with rice of course, my eating mood level goes up a notch and at the end I had ordered 3 servings of rice. Blame it to delectable dinengdeng. 1. Once arrived in Tuguegarao Victory Bus Terminal, it's best to check-in at any of the lodgings across the highway as they are cheaper and clean except one mentioned earlier. 2. Tanza Junction is walking distance from hotel row mentioned in tip #1 above. Once there you can get to Don Domingo Market easily. It's where branches of Jollibee and McDonald's are located. 3. Before you go to Sta Ana for Palaui Island adventure, make sure you have already bought items that you want to buy in flea market in downtown Tuguegarao as you might decide not to get back and head instead to Laoag City after Viaduct sightseeing. 4. Tricycle fare is only 10 pesos around Tuguegarao including from the hotel row area to the city proper although they charge higher at night. 5. Make Patapat Viaduct your last destination so that if you decide to return to Manila via Laoag City, you would have not miss out a spot in Cagayan. 6. After Viaduct tour, it's best to head to Laoag City as you get to see attractions in the city proper such as the bell tower, capitol bldg, etc before catching a bus bound for Manila. Not only that. You would have been into two important capital cities of Northern Luzon if you go to Laoag City. 8. Whatever city you want to leave from, make sure you book your ticket in advance to avoid inconvenience of being a chance passenger. 9. 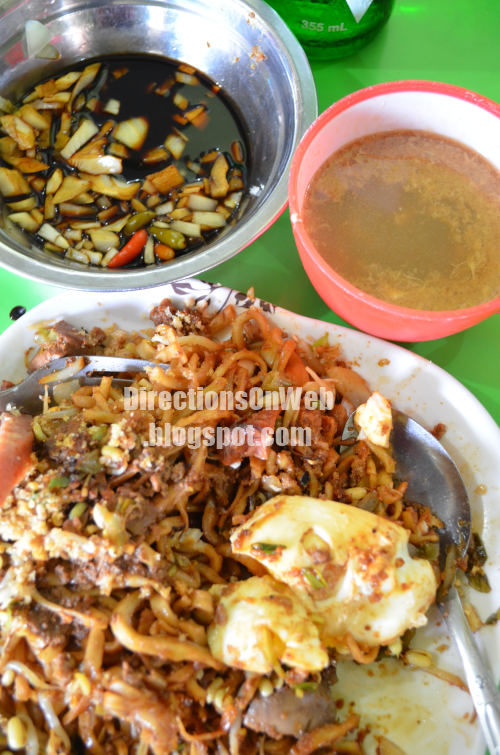 Jomar Panciteria, located very near to the Plaza area or downtown serves the best Pancit Batil Patong. From Mall of the Valley, cross Bonifacio Rd and take Gomez St which also borders Mall of the Valley. Walk past next intersection of Blumentrit St and Jomar Panciteria is on the right of Gomez St.
10. Pancit Cabagan is served best at an eatery opposite Victory Liner. Available at morning. Meanwhile, the superb dinengdeng is served at a large shack inside an open area opposite one of the lodgings there and at the same side of the highway where Victory Liner is situated. The best time to enjoy Palaui Island and the beaches there is during sunny season as it would be uninspiring during rainy days like when I was there in December, the waves are humongous and it's so unnerving at open sea en route to Palaui Island. Cagayan has different rainy season. Best months to be there - March to September. Now if you're not including Palaui on your travel of Cagayan and you don't plan to be on any beaches there, then, cold weather is not bad and December to February is great time to enjoy Tuguegarao City and its neighboring attractions.